The National Weather Service is forecasting that a mainly freezing rain event with some sleet mixed-in will develop starting between 6 and 9 PM this evening. 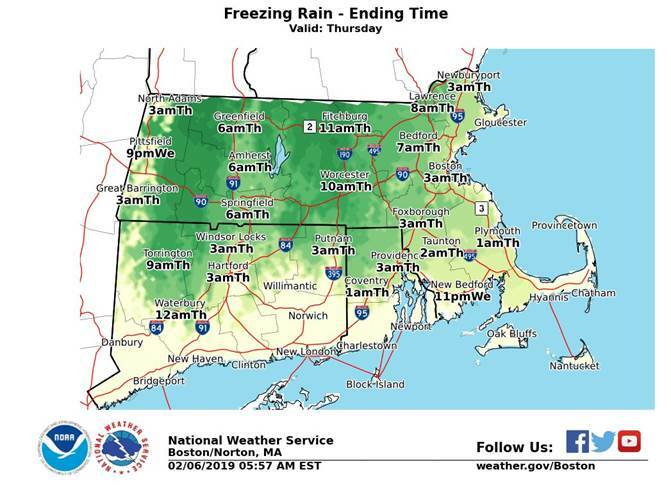 Freezing rain will continue through Thursday morning before tapering off and transitioning to drizzle by midday Thursday. 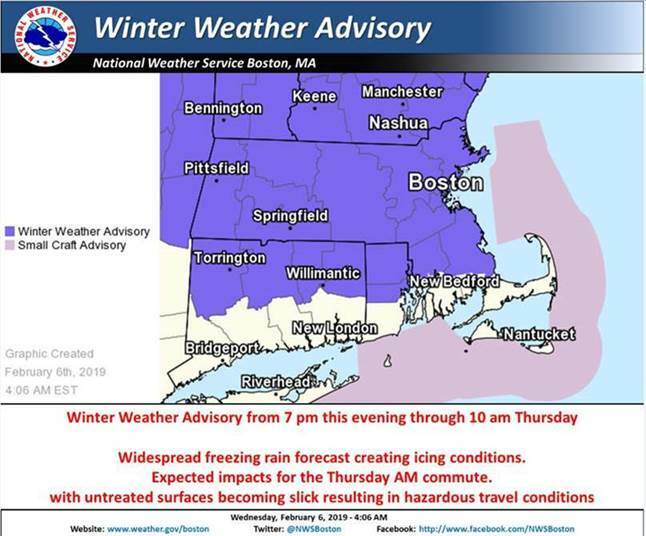 Up to .25 inches of ice accretion is possible, especially in central and western Massachusetts. 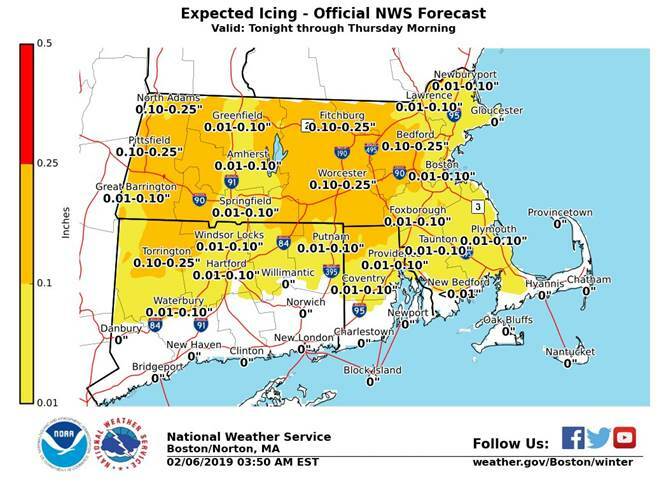 Icing during the Thursday AM commute, especially across interior areas of Southern New England away from the immediate coast. Untreated roads will become slick resulting in hazardous travel conditions. There is a low risk of downed limbs due to the weight of ice with the potential for isolated power outages. It is still unclear how far south freezing rain impacts will extend. 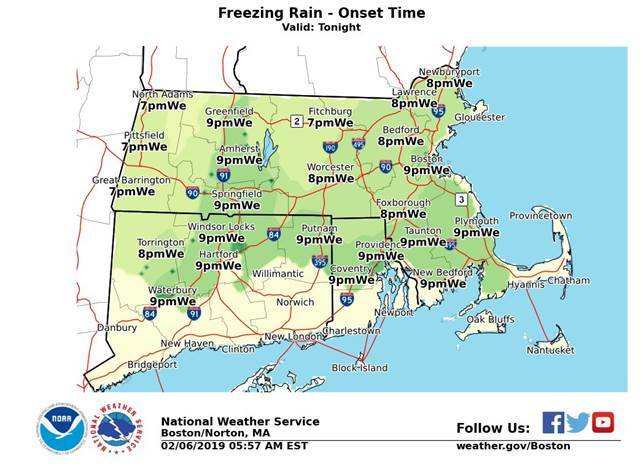 It is entirely possible that locations across southeast coastal Massachusetts (southern Bristol and southern Plymouth Counties), including the upper Cape, could see a brief period of freezing rain this evening, before transitioning to rain around midnight. Future forecasts will help refine this forecast. The State Emergency Operations Center (SEOC) is operating at Level 1 (Steady State Monitoring). MEMA will continue to monitor the forecast and will disseminate additional Situational Awareness Statements as necessary. Cities and towns wishing to share information or request assistance should contact their MEMA regional office or MEMA’s 24/7 communications center at 508-820-2000.